Place the rice flakes in a food processor or blender and pulse once or twice. Pour into a medium mixing bowl. Place the garbanzo beans in a food processor or blender and puree until creamy. Place in the mixing bowl. Add the rice and garbanzo beans and mix thoroughly. Let sit 15 minutes. Take about 3 tablespoons of the mix at a time and roll into 1 1/2" diameter balls and flatten balls slightly. Place on a try or plate. Heat oil in a deep fryer or heavy pot. Add several falafel to the oil at a time and deep fry until golden brown. Do not overfill as it will lower the oil temperature, creating soggy falafel. Remove and drain on paper towels. Repeat until all falafel are fried. Heat the pita bread in a 350° F. oven until warm. Remove and slice into wedges. Arrange equal amounts of lettuce, cucumber, tomato, and carrot on each serving plate. Place several slices of pita on each plate and 3 falafel. 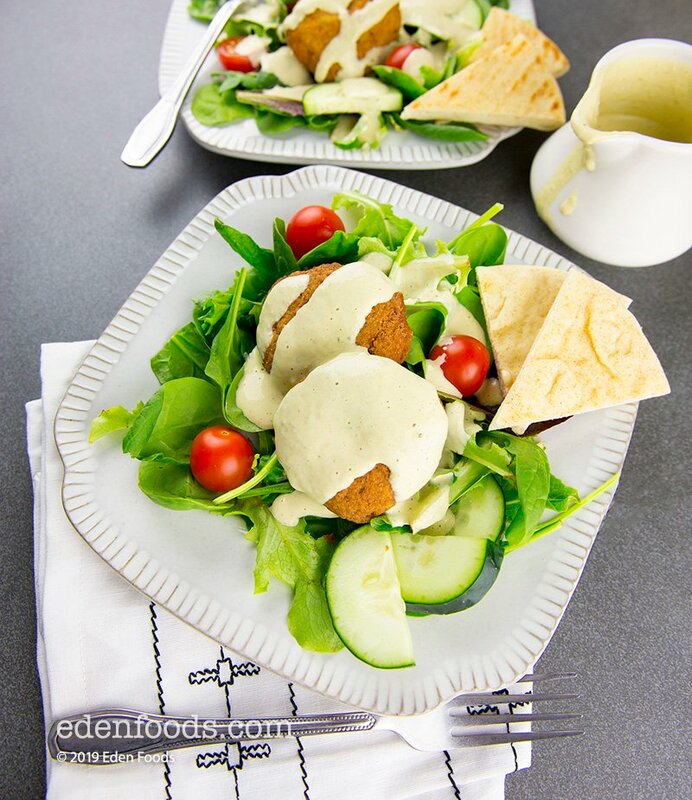 Spoon the tahini lemon sauce over each salad and serve.